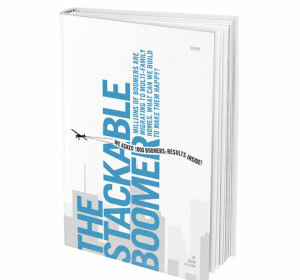 A background in real estate marketing and an interest in demographic shifts led David Allison to write his third book, The Stackable Boomer. Through surveying 1,000 baby boomers and interviewing 20 industry leaders, authors, urban planners, architects and others, Allison came up with a thesis that millions of baby boomers (born between 1946 and 1964) living in single-family homes are having to sell and move into multi-family units to fund their retirement. They’re not happy about it, so he calls them “reluctant” boomers. “We’re doing a very good job of building things for wealthy boomers who like marble floors and a concierge and a wine fridge, but not such a great job figuring out what the middle-class, average boomers are looking for within a budget that they can afford,” said Allison. While wealthier boomers look upon moving into luxury downtown condominiums as an intriguing adventure, that’s not the case with reluctants, who are often left with little alternative to purchasing a suite in a building more suited to first-time buyers. Many of them fear that living in smaller spaces without high-end fixtures and amenities will make them look like losers to their friends, according to Allison. Allison’s research indicated living rooms, dining rooms and kitchens are the most important rooms to homeowners, who like to show them off to their guests, and should attract more investment dollars at the expense of bathrooms. But a significant portion of developer profits have traditionally come from things middle-class boomers can’t afford or are willing to trade — including fancy kitchens and spa bathrooms — in an effort to get things more important to them. The founder of B/A, The Art & Science of Marketing Buildings believes this is an issue that will be of prime importance to “companies, developers, the trades that support the development industry, the consultants that work with the development industry, real estate agents and brokerages, and everyone else involved in this crazy market of ours” for the next 20 years. Allison said downsizing boomers also have a need for storage space in their units because they don’t want to place treasured items in storage lockers in the basements or parking areas of their multi-family residences. He urges developers to start thinking more creatively when it comes to storage and designing common areas that appeal to a cross-section of residents. Allison said the needs and desires of reluctant boomers should be considered right from the start with new building projects. Among the 1,000 surveyed baby boomers living in multi-family housing, there was a fairly even split between those who owned and rented. Allison found renters chose where they lived based on wanting to be close to their jobs, while proximity to work wasn’t a priority for owners. It was also discovered that renters want their buildings to be more modern and updated since many of them are old, while owners were more interested in home improvement within their suites. Vancouver-based Allison estimated that 25 per cent of boomers fit into the wealthy category, 50 per cent of them are reluctants and the other 25 per cent are what he labelled “the unprepared” since they’re “unable to participate in a multi-family home purchase” due to a lack of funds. Allison cites examples of local co-housing communities — consisting of privately owned homes with extensive common areas designed and managed by residents, who also perform much of the work required to maintain the property and prepare shared meals while meeting regularly to solve problems and develop policies — as a potential shelter option for these unprepared boomers. The Stackable Boomer is free for industry insiders who register at ​www.marketingbuildings.com and Allison has also created a related blog he hopes will generate dialogue on these issues. Look for The Marketing Buildings Blog to be published regularly by Real Estate News Exchange in the coming weeks.